Today the winds were 20-30 with gusts of 40. All animals hate this. Even the squirrels, the primo scroungers did not like it. It is getting dusty in these parts. So I took a little field trip to Baldwin, just 10 miles away. Packed up the dogs. Went to my favorite flea market. 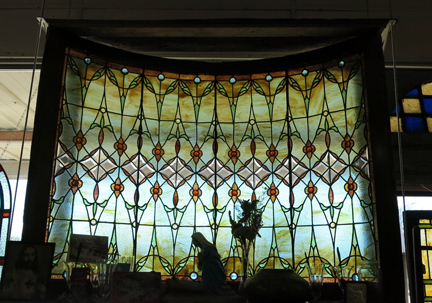 They have great stained glass and not so great stained glass. I love just looking at it in winter sun. I found two new stores. This town has a population of what? Maybe 2,000? In the middle of nowhere. They are re-habbing a lot of old buildings. I find a certain sort of peace in antique stores. I am currently reading "The Goldfinch" by Donna Tartt. 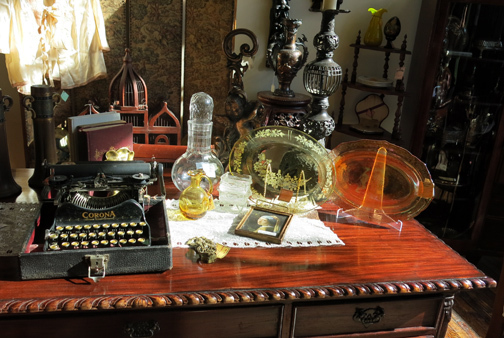 An antiques store/ refinishing shop is a big part of the story. I have my eye on one piece. I hope the owner likes "trade". I have had two antique shops really. Each totally dis-assembled to meet bills...except for a few pieces. Oddly, I might be getting back into the business.